There were early morning storms on Saturday morning delaying the start of our set up for this event. So much so that we were seriously worried that we’d have a wet and soggy start to the event on Sunday. However, as you can see from the image below, we and the other 163 participants were blessed with a picture perfect morning to kick off the first, of what we hope will be many more, Live More Event's here in Ipoh. We had a total of 16 races at this event. Our usual 14 with 2 additional ones for the U18 & Open Relay Teams. These were exciting to watch with, as you’ll see from the results, that you’ll find HERE… some really exciting and close finishes. We also had some spectacular individual performances from many first timers and everyone can be really proud of what they did. Most importantly, despite the speeds that some reached on the downhill sections of the bike course (I heard some talking about the thrill of going 50+ kmph) we had an almost incident free morning thankfully. There were relatively few scratches and only one where the poor young Lad was unable to finish because of the incident. This was a big relief naturally but what is especially pleasing was to learn from the Lad’s Mum yesterday, that his self confidence was not damaged. In fact, as soon as they got him home on Sunday, he was asking if he could go out on his bike and practice some more so he doesn’t make the same mistake again. We keep hearing from parents about how the discipline and focus needed to do a Live More multi-disciplined event like Triathlon has helped their children in more practical ways than just sports. For example, they have started to demonstrate important ‘life’ skills like more focus, better concentration, the ability to handle pressure and stronger determination to do their best. The willingness demonstrated by this young man to practice and improve is another one of these important ‘life’ skills that we try to embrace and apply within our set of Live More values. It is wonderful to hear that our participants are embracing these too in order to help them become both independent and fulfill the potential they have to have to a “Live More" life. Another wonderful experience outside of Sunday’s races was another couple of young men who realised after they’d finished that they had not recorded enough laps on the bike course. One of these came to us proactively to tell us of his mistake. The other spoke to us honestly about how they had ridden through the wrong part of the bike course. This takes a lot of courage to admit that you’re wrong and in recognition of this honesty and sportsmanlike behaviour we didn’t feel we could or should disqualify or assign them as a “Did Not Finish” (DNF) placing in the results. Instead, we chose to impose a time penalty to reflect the missing lap and avoid denying them a finishing time. 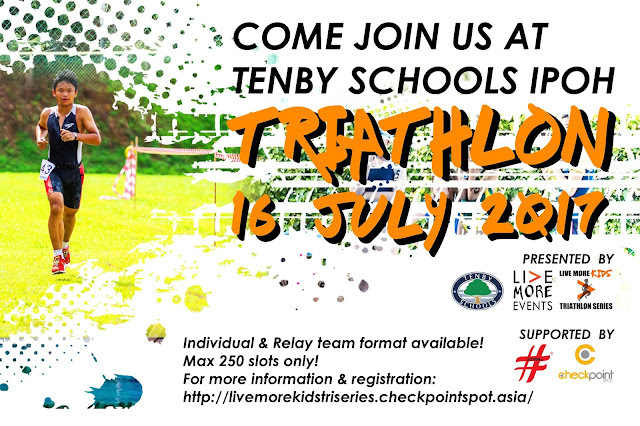 Overall, it was an absolute pleasure and privilege to see so many amazing smiles from the proud participants, especially the many new participants that took on the challenge of doing the multi disciplined event of Triathlon for the first time, and even bigger smiles of their even more proud parents. 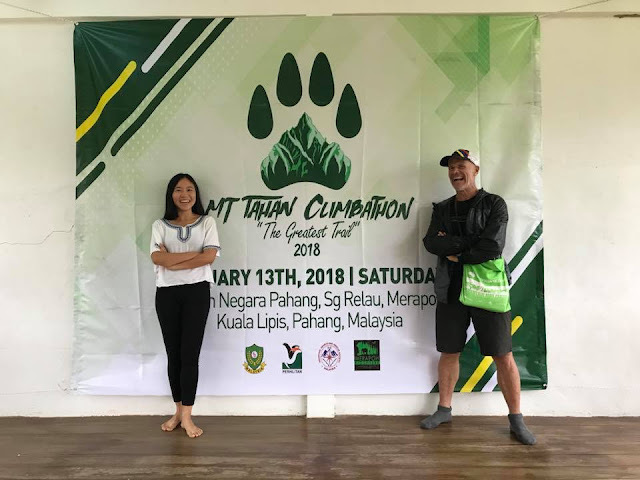 These were all made possible thanks to Jane Kuok, the Principal at Tenby Schools Ipoh for allowing us to put on the event at her wonderful campus located in the shadow of the Kledang range of hills that separates Ipoh from the northern part of the country. Thanks too, to Kirsty Meech, the School's Head of Physical Education, and the rest of the Faculty members and students for supporting our efforts to bring our 4th event this year to, what we believe, is one of the loveliest places in Malaysia. We’d also like to say a big “Thank You” to all the parents for allowing their children to participate in this new event and for making what we appreciate, for many off them, was quite a longer drive than usual to do this event. We feel very privileged that so many of you made the journey and hope that you not only had fun at the event but were also able to enjoy and discover Ipoh’s other delights. It was particularly pleasing to see for example, a large contingent of participants from the Premier Triathlon Club up from Malacca and the TRI-AMateur Club from Putrajaya, that is otherwise known as Team M3X. Additionally, there were also many more familiar faces that had made the trip up to Ipoh individually. We’d also like to say how delighted we were to see not just these familiar faces join us here in Ipoh but to see so many new ones from the local community along with their Mum’s, Dad’s and Grandparents who were supporting them as well. It was especially pleasing to see some of these local “newbies” not only enjoying the thrill and achievement of taking on the challenge of a multi disciplined event like Triathlon but also getting on the podium at their first attempt. Whilst we are talking about the local participants and parents who supported this event, we’d like to say a special “Thank You” to two particular sets of parents. As without the encouragement and support of Titus & Christine Raj and Navin & Jasvin Wathan this event would not have happened. They have been great supports of our events in the Klang Valley area. They are also great examples of our primary purpose here at Live More which is to put on events that help families ”Live More” by participating together and supporting each other in a healthy and challenging activity like the ones we organise. They deserve a special mention though because they nagged and cajoled us to bring the event to their home town of Ipoh and supported us above and beyond our expectations by assisting with the set up and the promotion of the event to their friends and family. We are so grateful for this and owe them a special vote of thanks for helping us put this event on here which, we now hope, can become a regular part of the sporting scene here. Our deepest and sincerest thanks to yet another awesome team of “Tri Hard” volunteers who helped make this event possible. We were blessed with meeting many of your for the first time on Sunday but will most definitely not want this too be the last time we do so and for those of you that expressed an interest we will be back in touch with you very soon.